Occasion: The RV show at Dulles Expo Center. I’d wanted to visit Lost Rhino Brewing Company for a long time, and even more so after trying their Rhinoel at the winter beer tasting at RFD. But we rarely venture to the Dulles area, so I was looking for an excuse to get out that way. I found it in the RV show. We wanted to get out of the house on a cold Saturday in January, so we decided to trek out to the RV show at the Dulles Expo Center. We’re new RV owners, and the show was a great way to get campground ideas for the summer. We also had fun day-dreaming about the new RV models and the kids were entertained by going in and out of the RVs. After a couple of hours, we had our fill, and it was time for a beer! 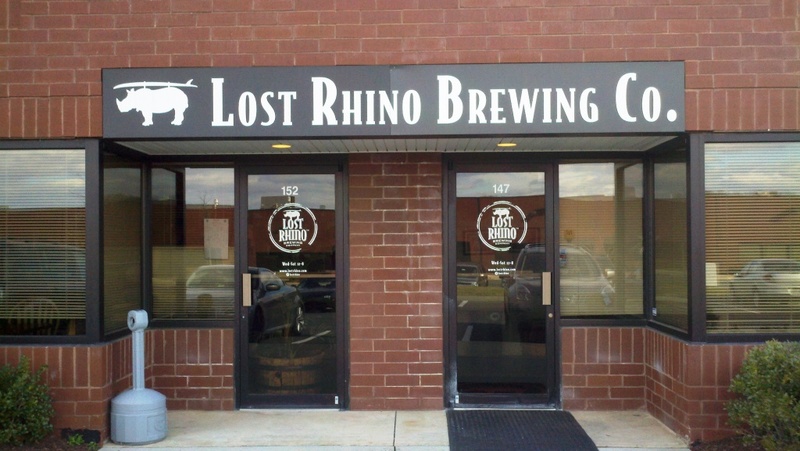 Lost Rhino Brewing Company wasn’t far from the Dulles Expo Center. It’s in a new office/warehouse complex not far off the Dulles Toll Road. The NFL playoffs would be starting later in the day and we were looking for some good brew to enjoy with the games. We decided not to do the tour – the view into the brewhouse through the large windows in the tasting room was good enough for us. We dove right into the samples so we could determine which beers to take home in the three empty growlers that we brought. Best Beer: New River Pale Ale. It had been many years since I last drank a New River Pale Ale, which used to be contract brewed at Old Dominion Brewing Company. It was always one of my favorite Pale Ales, and I was disappointed when it disappeared from the beer store shelves about five years ago when Old Dominion stopped contract brewing. According to the Lost Rhino web site, they acquired the rights to New River and brew it using the original award-winning recipe. I was most impressed with: The quality of the beers. Lost Rhino is craft brewing at its best. You can taste the craftsmanship that goes into the brews. All of the beers were excellent, and we filled our growlers with the Pale Ale, Pils, and Dubbel.